So you've finally got in the habit of bringing your reusable bags when you go grocery shopping (or at the very least you feel horribly ashamed and guilty if you forget them) ... but what about the other plastic in your life? What about those silly Ziplock bags that don't really have a viable eco-alternative? 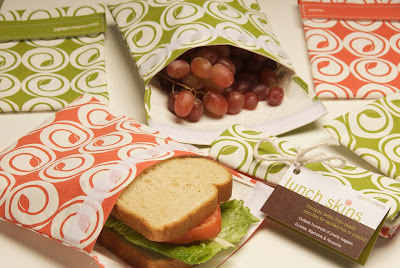 Introducing Lunch Skins by 3greenmoms! Moisture and grease-proof, these Ziplock replacements are even dishwasher friendly. Great idea and cute patterns to boot.